This is Sid who is a new cat in and FIV+ we are always looking for foster homes for cats like him. Fostering a cat would give invaluable help to us as we do not have an animal shelter. It would give cats like Sid a second chance by providing a safe environment prior to re-homing. Fostering a cat can be very rewarding and helps them to adjust to living in a home again with people whom they can trust. This gives them a better chance of being re-homed to a permanent home. What is expected of a fosterer? A fosterer will look after a rescued cat in their own home. This will involve personal care of the cat, feeding, medicating if needed, and cleaning out dirty litter trays. The fosterer will be expected to provide food and litter for the cat and a foster fee of up to £1 per day can be paid if needed (this is paid at the end of the month on receipt of a claim form). All our cats have been to the vet and received their treatments. Only sometimes follow-up visits are needed. This is all covered by the charity but fosterers are expected to keep us informed if and when visits are due. Some foster carers have their own transport and so, if they would want to take the cat for any of these visits themselves we would not object but we would need to book them in. Otherwise we would arrange a volunteer to collect the cat for these visits to the vet. A flat is as good as a house as foster cats are not normally allowed outside as they take a good while to adjust to a different environment. 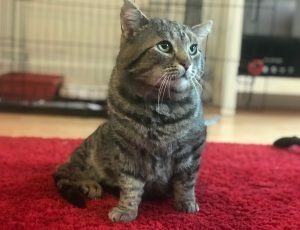 A spare room is an ideal place to keep a foster cat as the larger the space in the beginning the more anxious they can become as they feel safer in more confined spaces. Some cats are started off in a pen and this is provided until they feel more confident. What if I don’t have a spare room? This is not a problem. You can start them off in one room until they get used to you and become more confident. A pen is useful here so they learn about every day living noises and don’t get too nervous before being introduced to the rest of the accommodation. What if I have my own cats? It is always more difficult to foster when you have your own pets. That is where a spare room is useful. If you have your own cats, be prepared for a few growls and hisses as not all cats get along. They can get better with time, but this is not always the case. The cats remain the property of the charity until placed in permanent homes. These homes are carefully checked out by a volunteer. If a fosterer knows of someone who may be interested in re-homing a cat then they should pass their details onto us so we can follow it up. What if I don’t get on with the foster cat? Always contact us immediately if you have a problem. We can always give advice and come around to see if we can help in any way. We can always take the cat back — if you’re not happy with the cat, then it’s likely that the cat isn’t happy either.